What are QR Code Labels. Dantech ID Marking News and Articles. QR code is a 2D type of code used mostly by industry for marking small parts due to its small size coupled with its high reliability. 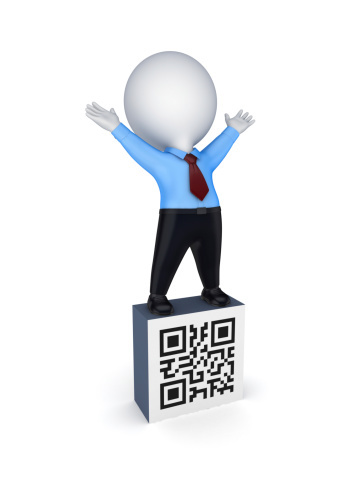 QR codes are made up of square light and dark blocks with matrix dimensions from 10×10 to 144×144. Encoded information is made of a string containing characters or numbers. As more data is encoded in the symbol, the number of cells is increased. As highlighted above the most popular application for QR codes is to mark small items, due to the code’s ability to encode fifty characters and still be readable at 2 or 3 mm2. If as part of your business or organisation you have a number of valuable items or equipment that are small in size asset labels or tags using QR codes can be a great way to keep track of both their condition and location. In addition small asset items by their nature are at high risk of being lost or stolen so having a permanent QR code label also helps deter and thus lessen the risk to these items. 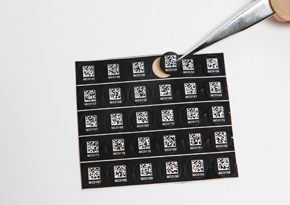 Dantech QR code labels are small and tough laser engraved into a Acrylate material they can withstand harsh environments, chemicals, abrasion and heat. These ID labels are so strong they are even suitable for tracking surgical instruments.